Announcement Tiny Tiger Art's mission is simply, to help save pets. So many of our "Pack" (animal lovers) wish they could adopt more animals, or DO more for them, somehow. By banding together as a tribe of animal advocates, we CAN do more. You choose which charities we give to each month (when you join our email list) You get inspiration every day with the pieces you purchase. And, you are reminded that WE are a powerful pack of Good Humans, giving voices and much need support to our furry friends. These pet-inspired products are a great way to keep in touch with friends and family and they make thoughtful gifts for pet parents! Please contact me if you have any questions or if you are interested in selling my items wholesale and don't forget to "favorite" my Etsy shop! Thank you for being a voice for the animals and for spreading inspiration with your new Tiny Tiger products! Tiny Tiger Art's mission is simply, to help save pets. A Dogs Love * MOUNTED Print 5x5x1-1/2" Uniquely and tastefully embellished with fun metallic shimmers in keeping with the original artwork. 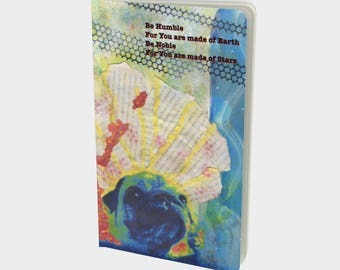 Pet Series Greeting Cards and Note cards! Fun images and words each card uniquely embellished with metallic paints or shimmers. I Bow to your Brilliance* Mounted Print 5x7x1-1/2 a happy dog, a bubbly, fun print - subtly 'sparkled' for you or someone you love. Blue Cat 1 * MOUNTED Print 8x8x1-1/2" Uniquely and tastefully embellished with fun metallic shimmers in keeping with the original artwork. Beautiful, creative cards. Professional seller. Highly recommended! Beautiful items tied in a lovely ribbon. Quick, professional seller. Highly recommended! Creating fun and colorful mixed media pet art for you! TINY = is the small, quiet voice inside which is in fact our own powerful intuition. And our intuition is tuned into our heart and to wisdom that is greater our individual self. TIGER = symbolism has been tied to personal power for centuries. In Tai Chi there is a pose where we ‘ride the tiger’ and ‘own’ our personal power. The embodiment of my tiny tiger is “Peanut”, a little runt kitty that I fostered from birth, who at a few weeks old, couldn't walk with her brothers and sisters. But with a little love and care and, she has turned into a brilliant roaring tiny tiger, who walks, runs, jumps with joy! My art is all about pets! My shop is a showcase for my mixed media pet art and includes my art on clothing, accessories, dog and cat greeting cards as well as wall art prints. My blank note cards are a great way to keep in touch with friends and family far away and my prints make perfect pet parent gifts! But I'm even more excited about my new wearable and totable art! So cool! I live in Evergreen, Colorado, but I was born in Chicago. City and mountains - I love it all. I have always been intrigued by the combination of words and images and this is why I love mixing media to create delightful, colorful, fun, and inspiring mixed media works that reflect my joie de vivre. My mixed media is inspired by a love of pets - sometimes funny, always profound in their unconditional love. I use a vast palette of mediums and metallics because I must "make it sparkle"! My artworks can be found in private collections nationally including in California, Illinois, Colorado and Hawaii. My prints and cards are all professionally printed by an amazing printing companies by people who care about art! We use high quality fabrics, papers and inks to produce a superior printed product. I'm a firm believer in giving back and Robin Art gives a minimum 20% of sales to Animal Welfare Charities, helping pets to be adopted and loved happily ever after! Please add my shop to your favorites and Share the shop with friends who love animals like we do! I hope you will you be inspired and delighted! My dream is to gather a tribe of people who 'wish they could save every dog or cat". The Tribe gives to give to animal welfare groups that we know and love. TinyTigerArt items are your 'touchstone' to remember every day that we save pets! AOW transforms my art into usable, wearable items. They work with artists all over the world to create beautiful, sustainable things, that are eco-friendly and delightful to all your senses. Thank you for shopping at The TinyTigerArt Etsy Gallery! I hope to inspire, delight and engage you with a sense of fun and beauty. All the art here is my original art - prints and cards are reproduced by and amazing printing companies by people who care about art! We use high quality papers and fabrics, nice to touch, beautiful colors - non of that glossy 'Hallmark*" paper for my cards. The prints are mounted on 1-1/2" deep 'cradled panels' and so are easy to stand up on their own or hang on the wall. Their 'chunkiness' makes them look Faboo in groupings too! Please Note: My old "JRA.com" at the bottom is NOT on the actual prints - it's just on the web versions. You can learn more about being a member of the Tiny Tiger Tribe at TinyTigerArt.com. Members get to help choose which charities to support and also get discounts and special offers on TTA products. Thank you! I appreciate your delight and your business! I hope you will be entirely delighted with my art! If you are unsatisfied with your product for whatever reason, please contact me and return the un-used item within 7 days. Upon receiving the item, I will issue a refund (minus the cost of shipping). I accept Pay Pal, checks through PayPal and credit/debit cards for payment. Please note that you don't need an account in order to make a purchase. All you need is a credit card, debit card, or bank account to go through PayPal. For PayPal eCheck payments, I only ship after payment clears, which sometimes takes an additional 3-5 business days. I will send you confirmation of your order within 24 hours of purchase. Your item will be shipped within 4-5 business days unless otherwise notified. All items are shipped via USPS 1st Class Mail. Larger orders - and mounted prints and frames/mounted originals are shipped 2-Day Priority (recommended) I can ship any order 2-Day Priority, prices starting at $5.60 - please send me a personal note to make sure I can get the items produced and shipped within your time frame and to give you the associated costs. I will happily ship GIFTS straight to the recipient as well as include a personal note as requested, just leave me the info in the note to seller at checkout. While packages generally arrive MUCH sooner, I allow the post office up to 2 weeks for Domestic delivery. Please inquire regarding any international shipping to determine price and timelines. Thank you for your understanding. The postal service is a fickle being. Please remember that shipping around any holiday can be very unpredictable- as we all know and have no doubt, learned from experience!